One day I was looking through a tar file and looking for an executable. When I use ls, I can do this at a glance by just looking for green filenames, as I always have my ls configured to show executable files in green. It occurred to me that it would be nice to see the same kind of coloring when looking at the contents of tar files with tar tvf. Thus, TarColor was born. It was a quick Perl script to scratch my own itch. I thought others might find it useful, so I put it on GitHub and CPAN. The format for LS_COLORS and TAR_COLORS is the same format used by LS_COLORS (used by GNU ls). So if you use GNU ls and have your LS_COLORS set, then tarcolor will use similar colors as ls. If you want to tweak your colors and don’t want to edit LS_COLORS manually, you might try this online LS_COLORS generator. I pretty much followed these instructions, but one extra step was required. 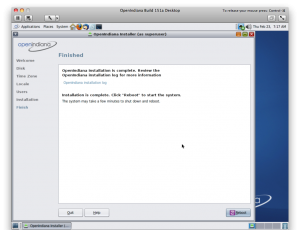 The problem that I was having was that the system kept running out of file descriptors and becoming unusable. After a little digging around with fstat and such, it was apparent that gam_server from Gamin was the culprit, using some 3700 file descriptors. From a bit of web browsing, I saw that this is somewhat common on BSD, because BSDs don’t have inotify like Linux, so Gamin uses kqueue but this requires opening files and using file descriptors. This is described in the Gamin Wikipedia page. While this deals quite a bit with TDD and mock objects, it’s also largely about a particular style of OO design, one that reminds me a lot of some of Allen Holub’s writings. It’s not very specific to Ruby (it has some examples in RSpec – that’s about the extent of the Rubyness). 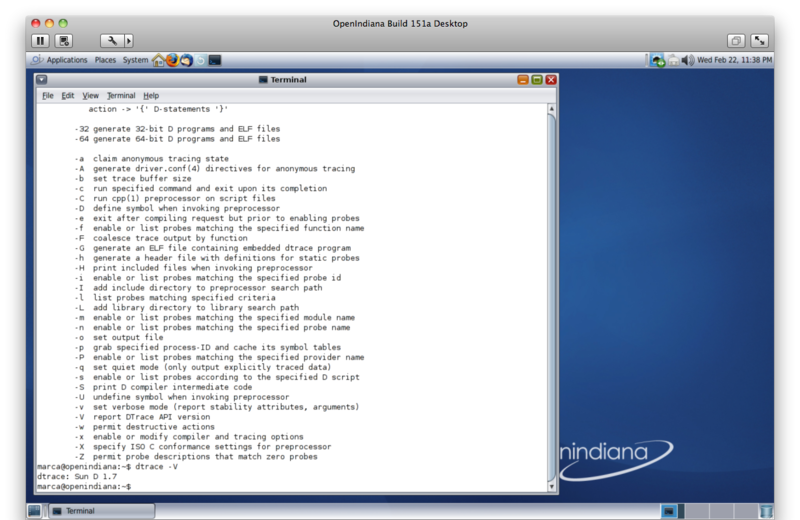 I’m in the process of installing OpenIndiana b151A in a VMware Fusion virtual machine. Main reason is that I’ve become interested in DTrace and DTrace comes from the world of Solaris. OS X has DTrace too, but I’m noticing that it differs quite a bit from DTrace on Solaris, especially when it comes to developing with it — i.e. : instrumenting software with USDT probes. A while back, I posted about how OmniFocus maintains a sqlite database. This could be really interesting for writing software to do new stuff on that data. Jared just dug into this and noticed that the completedDate field was an integer, but it did not appear to be a unix epoch time. I just did a little experimentation and it seems that OmniFocus is setting dateCompleted to the number of seconds since Jan. 1, 2001 00:00:00 GMT.